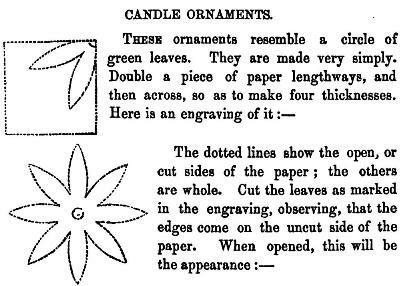 This page attempts to record what is known about the origin and history of circular fold and cut designs in the form of Paper Flowers or Doilies. Please contact me if you know any of this information is incorrect or if you have any other information that should be added. Thank you. The Paper Doily is still widely used as a craft activity in British primary schools. 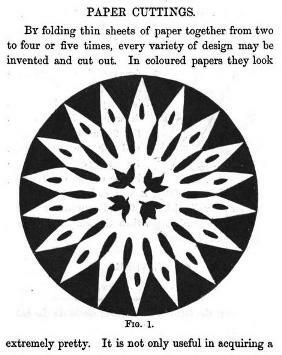 A primitive circular fold and cut design that resembles a flower, although it is called a Candle Ornament, appears in 'The Girl's Own Book' by Lydia Marie Child, which was published by Clark Austin and Co in New York in 1833. 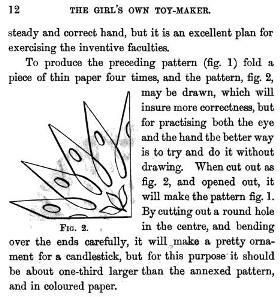 As far as I know the first appearance of the Paper Doily design is in 'The Girl's Own Toymaker' by Ebenezer and Alice Landells which was published in 1860 by Griffin and Farran in London and Shephard, Clark and Brown in Boston. The design also appears in 'Hanky Panky', a book of magical effects, puzzles, recreational mathematics and other amusements, by W H Cremer, Jun, which was published by John Camden Hotten in London in 1872. 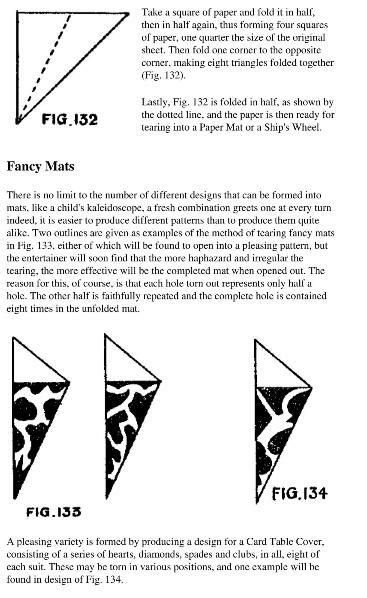 This effect also appears, under the title 'Fancy Mats' in 'Paper Magic' by Will Blyth, which was first published by C Arthur Pearson in London in 1920. 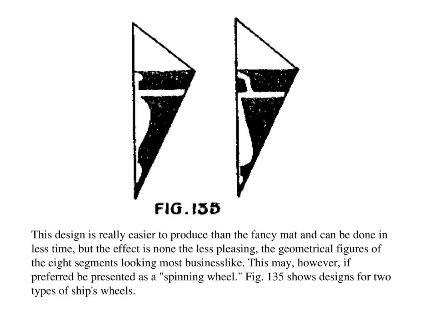 The same book includes similar instructions for malking a 'Ship's Wheel'.